Bringing it all together means right down to your trash receptacles. Our Stadium Series trash cans provide great options for adding a professional touch to your facility, indoors or outdoors. All models come with three top styles to choose from: Dome Top, Hood Top, or Flat Top. 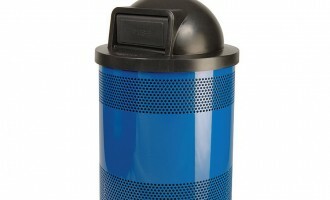 With a durable plastic liner and lid cable, these waste receptacles are built to last. Standard is the 55-gallon size, but contact us for pricing on 35-gallon trash receptacles. The Message Center model is a perfect way to add promotional sponsorship revenue to your facility with the easy-change panels. Both the Message Center and Custom Logo models will customize your waste receptacle with your team, company, or league logo.